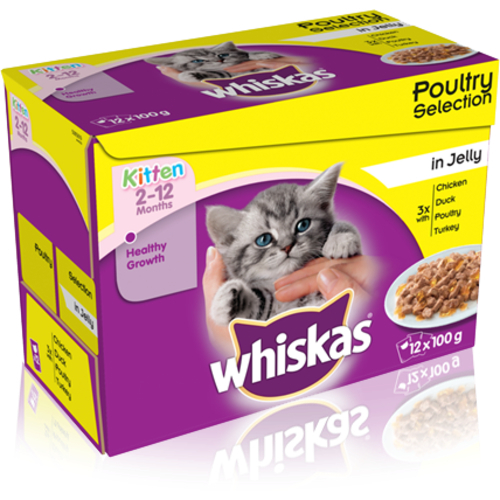 Whiskas Kitten 2-12 months Poultry selection in Jelly is complete food for Kittens. 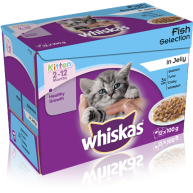 Specially formulated to support healthy growth, this selection pack contains calcium to support the development of strong bones, Vitamin E and minerals to help support a strong immune system. 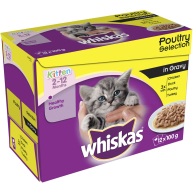 Each pouch is filled with nutritious meaty pieces in four different flavours, Chicken, Duck, Poultry and Turkey. 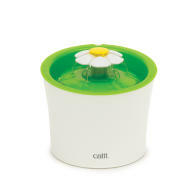 Free from artificial flavours, colours and preservatives. With Chicken: Meat and Animal Derivatives (including 4% Chicken), Oils & Fats, Minerals, Various Sugars. With Duck: Meat and Animal Derivatives (including 4% Duck), Minerals, Various Sugars. 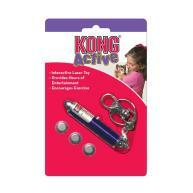 With Poultry: Meat and Animal Derivatives (including 4% Poultry), Minerals, Various Sugars. With Turkey: Meat and Animal Derivatives (including 4% Turkey), Minerals, Various Sugars. Protein 8%, Crude Fibres 0.2%, Crude Oils and Fats 6%, Crude Ash 1.6%, Moisture 83.5%.